You are now able to add announce date, on sale date, and pre-sale dates to events, and these can be viewed on the calendar. For more information on how to add and view publicity dates, please see this article. You are also able to add post-show numbers and report on them. This information is added on the event details page, and this article has step-by-step directions. Publicity dates and the flash report are located on the new Live Entertainment tab on the event details page. To add this tab to the event details page, specify certain event types as live entertainment types (such as concert, sporting event, etc). Directions to update your event types are here. We've locked down more information when the Hide details from non-bookers setting is on for an event. For all the details, please see the updated article here. When you're on the calendar and you confirm an event which has the Hide details from non-bookers setting on, we'll ask you if you'd like to turn that setting off now that the event is confirmed. Just click yes to toggle it off! Operations can now access the Tasks page! Users with the Director of Operations or Operations Staff role will now have the Tasks page, where they'll be able to add, view, and complete tasks. They'll also be able to add notifications, so they can receive an email when a task is assigned or get the daily task digest. If you book events, you may now set default times which will automatically populate the time for the booked spaces on the Add Event slider. This article will walk you through this. Accounts and contacts can now be made inactive. By default, inactive accounts and contacts will not display in the list views, but there is now an option to show them. They also will not show up in searches unless you've checked Inactive. To inactivate an account or contact, click the more info menu on the right side of the header and select Inactivate Account/Contact; full instructions (including viewing in the list views and search) are here. We've added a Tax ID field to Accounts which can be pulled into invoices and other documents (instructions here). If you are required to list this due to VAT or other legal requirements, please contact us to have this added to your templates. We are launching our Simpleview integration for VenueOps! 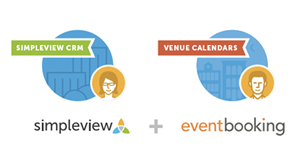 This integration gives DMO event planners a single sign-on connection to your VenueOps calendar. Since this connection is based on a user created in your VenueOps account, you have complete control over the roles assigned and can deactivate it at any time. If you are interested, please contact us at success@eventbooking.com. For more information, please see our blog. If you have booked a combo room on an event, you are now able to create functions in individual member rooms as well as in the combo itself. 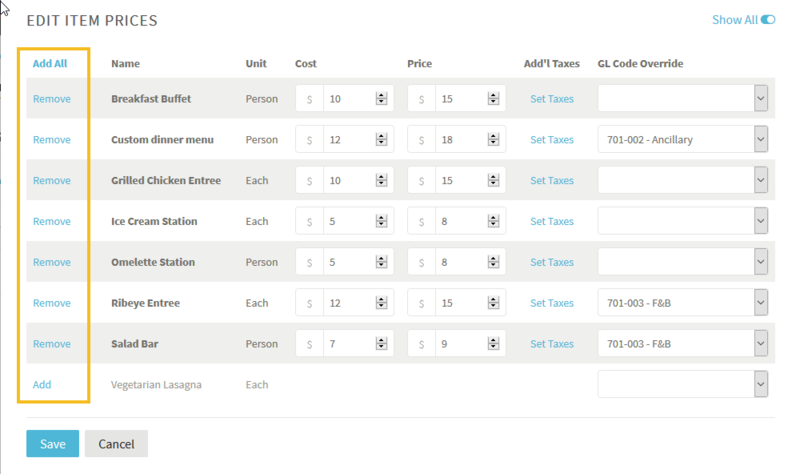 You are now able to add instructions to functions and event-wide details without setting a price schedule. All information for items which is contained in the price schedule is "stamped" on the event when it is added: cost, price, GL codes, taxes, and service charges. If you change any of these items in the price schedule, information for items which were already applied to an event will not be updated. If you change the price schedule on an event, you will now have the option to refresh item information from the new price schedule. This also means that if you make changes to a price schedule, you won't have to remove items and re-add them; simply change the event to a different price schedule and then change it back to the original one, choosing to update pricing when you do so. You may now drag and drop multiple documents to the event documents and account documents tabs. We've also moved the uploader to the top of the list so it doesn't keep moving down on you. We are now going to prevent you from creating duplicate Revenue Streams and Staff Assignments; we're also going to give you an extra message you when you delete either one. Both of these changes are due to problems caused within Insights reports. If you delete a revenue stream or staff assignment, we're going to have to update any reports that use them, so shoot us an email and we'll get that done ASAP. In price schedules, we've updated the labels on items to added and removed, rather than active or inactive. There is no change to the underlying behavior, but we want to make it clearer that when you remove an item from a price schedule, the item's cost, price, and other information will not be saved. You may choose landscape or portrait. On non-avails monthly calendars, you many choose whether or not to include the end of the previous month/start of the next month days which display on the calendar in the program. If the calendar splits across pages, the header will repeat on each page. We've made the output more compact. We're now logging when an account is created. This will display in a column on the Accounts List. Since we didn't track this before, all current accounts will be listed as created on the date of this release. 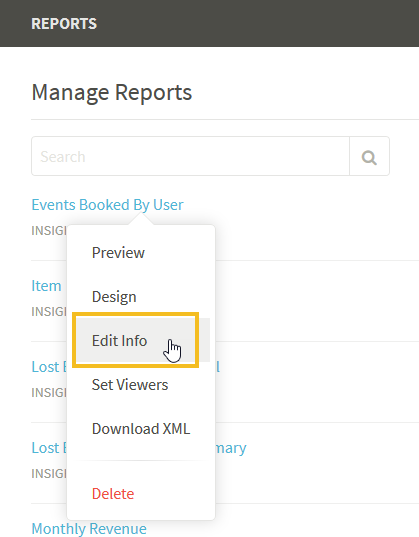 You are now able to rename and add descriptions to Insights reports. The description will also display on the reports page in the main app. 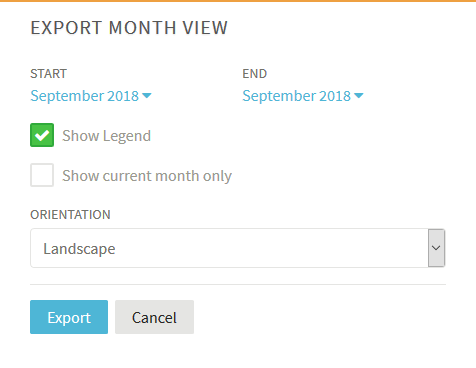 These options are available on the Manage Reports page for Insights Admins - just click on the report name and and select Edit Info. We've added double arrows to the monthly calendar. Click to jump forward or back a year! We've added a favicon for when you create a home screen shortcut on your phone. You'll just need to delete your shortcut and re-add it. Need instructions? See this article. We've added lots of options to the document templates. Please contact us if you would like your templates updated! A field for a staff assignment user's email. We've made two decimal places the default format for anything money related. On accounts, you can now add the account ID, description, and Tax ID. 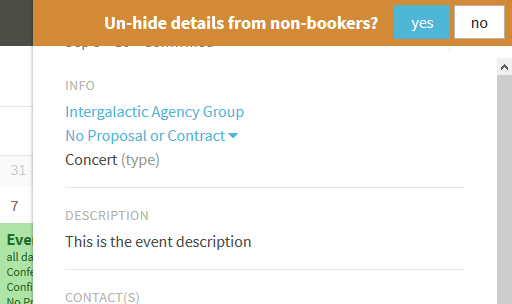 On events, you can now add the description and list all contacts on the event. These fields are available for both items and instructions: department, category, function name, function EXP and GTD attendance, function room, start and end date/time. 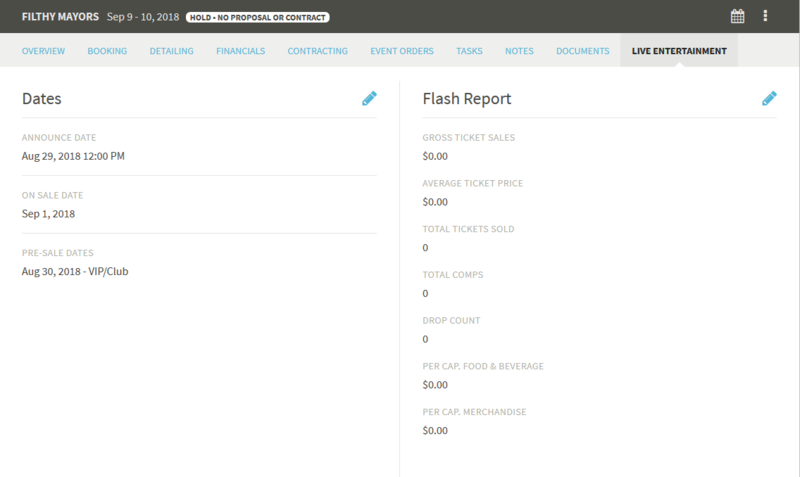 You are now able to show financial totals for each department, each category, and for all charges. Able to group items/instructions by department then category. Charges can be grouped by function then department. You are able to list revenue by revenue stream. More fields! For events: type, decision date, probability of close, price schedule name. 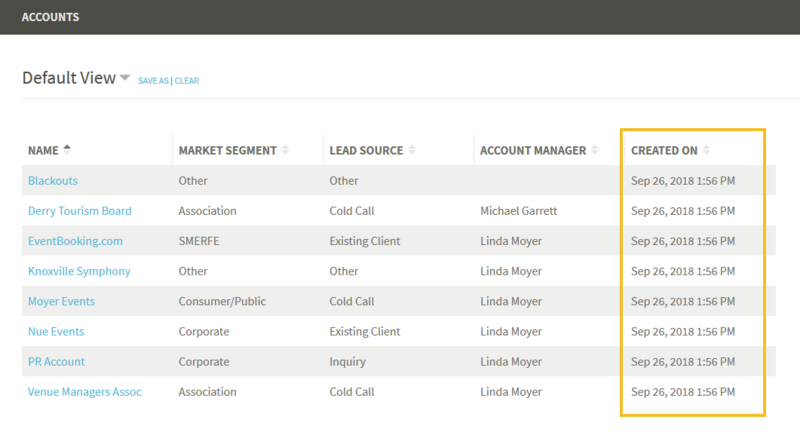 For accounts: lead source and market segment. We had a checkbox bug, in Firefox and in Chrome on Mac, where the slider would collapse when you checked an item. This should be fixed! If you set your account week to start on Mondays, the calendar on mobile was not displaying properly. Line breaks were not being respected in emails. On smaller screens, the Add Items slider was not showing the list of items. Now it will if your phone is in landscape mode. The price for exhibitor orders was pulling into accounts incorrectly from the online store on accounts that have back-calculated taxes. If a user had the Booker role and their default visibility setting for show name on avails (if confirmed) was on, this setting would persist even when the booker role was removed. On a contact's details page > events tab, the events are now ordered by date. On the "Add Series" slider, users were able to save events without adding a booked space. On the event details page > Financials > Summary, the client total did not display if it was negative. You were able to select both a combo room and its members as your default.